I’ve drawn many sketches from HP Lovecraft stories, but this is the first time I’ve ever illustrated an M.R. James story. This drawing was the result of a commission to illustrate a scene — actually, a drawing within the story — from Canon Alberic’s Scrap-Book, James’ typically creepy 1894 ghost story. 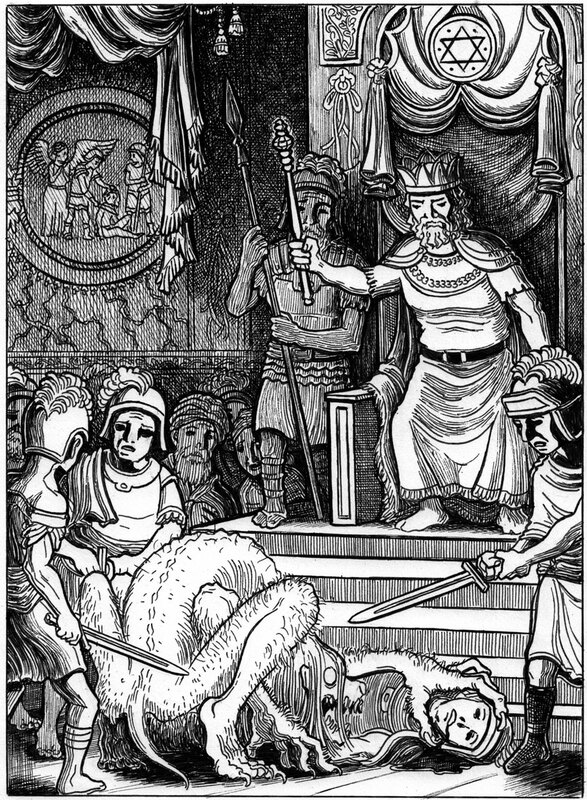 Within the story, the drawing is supposed to be a late 17th century Bible illustration of Solomon’s court, so I googled around and tried to go with a similar Classical style — conveniently, there are even drawings of King Solomon in Bibles from that period. Drawing in this heavily crosshatched Classical fashion actually works fairly well for my preferred pen & ink style, but unfortunately, there are a few weak spots in the drawing, so I might clean this piece up a bit at some point. If you haven’t read James, the best place to start is the M.R. James podcast! And here’s the site of the filmmaker Brian O’Connell, who commissioned this drawing! I’m working on some new RPG artwork right now, but I’ll be getting back to The Stiff soon. In fact…. prepare for some Stiff stuff NEXT WEEK! Excellent work. I can’t help but say you “beat me to the punch” on this one. I have been mulling over an identical illustration for some time. Here is a prelim sketch I did recently http://sta.sh/01zjqaq9s08q Your demon is excellent: it’s both traditional and “spidery”… just like the story. That lank, greasy hair and those over sized hands do the trick!